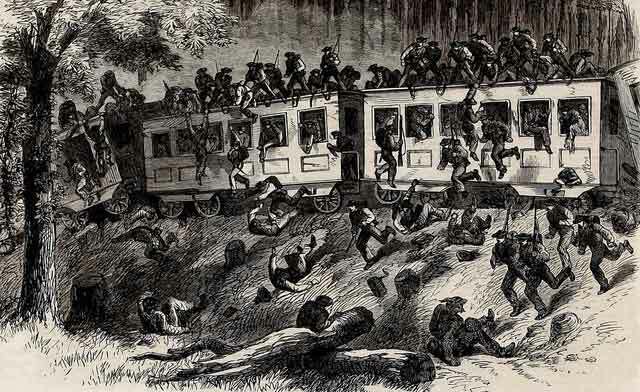 On New Year’s Eve in 1862 about three miles west of Edward’s Depot in Hinds County, Mississippi, at about 11 o’clock in the morning, Richard White, the engineer of the Southern Railroad line was traveling between Jackson and Vicksburg at a safe speed with his human cargo – four cars packed with Confederate soldiers going to the front. Many were veterans of the recent bloody battle at Corinth now headed to the trenches of Vicksburg to defend Vicksburg, that Mississippi River "key" which President Lincoln felt he must have in his pocket in order to defeat the South. Suddenly, without warning, disaster struck and the train plunged off the track, according to a soldier’s letter, originally published in the Jackson Mississippian and later picked up by several New Orleans papers. The letter, written December 31, 1862, from Edwards Depot, Hinds County, Mississippi, was penned by Pvt. Charles A. Cone, age 29, of Company C of the 28th Mississippi Cavalry. Private Cone, on extended sick leave from Vicksburg and himself a passenger on the train at the time of the wreck, reported the horrifying details of the carnage: "The four cars freighted with soldiers, were crushed into a mass of ruins, and the brave defenders of our country thrown into the crushing wreck, killed and wounded. The shrieks, cries and groans of the dying, mangled and crushed unfortunates in the shocking scene was, indeed, most painful to behold and heartrending." Cone was quick to exonerate the engineer and to name the Southern Railroad itself as being at fault in the wreck. He stated, "No blame can be justly attributed to him [the engineer, Richard White], but to the miserable and dangerous condition of the road…. Of late, I have, with others, considered it almost worth one’s life to travel on this road, and was, at the time of the disaster, on the lookout, and jumped in time to save myself. The engine first left the rail, owing to a bad joint in the track. I make this statement upon the authority of a soldier who saw the rail where it gave way." Five died immediately in the tangled wreckage. Two were brothers - George W. and J. J. (James Jackson) Miles of Lauderdale County, MS, sons of Elizabeth and Joshua Miles, a veteran of the War of 1812. George W. Etheridge died leaving a young widow, and H. P. McCartney died unmarried. All were privates in Captain Coopwood’s Company G of the 35th Mississippi Infantry Volunteers, recruited in the spring of 1862 at West Point and Corinth. Twenty-four-year-old Richard Lowry, of Talladega, AL, Company L , 30th Alabama Regiment lost his life as well. Private Cone also wrote of the death of a comrade who was injured so badly in the wreck that he died soon afterwards. "It is painful to write of the death of J. L. Andrews. He was one of the most promising young men of Madison county, and a chivalrous, accomplished gentleman." According to family genealogy, Private James Lindsay Andrews, was the son of Rev. John Girault Andrews, Sr., and his wife Martha Lindsay of Mount Ida Plantation near Vernon, MS. He had been a student at the University of Virginia for a short time. In February of 1862 he married Carrie Thomas and was the new father of a baby girl. He enlisted in 1862 at the formation of Company A, of the First Mississippi Light Artillery Regiment, led by Col. William T. Withers. The artillery would soon attain fame at Champion Hill and Chickasaw Bayou - but without Private Andrews. Many others from Captain Samuel R. Coopwood’s Company G, of the 35th MS Vols, were hurt in varying degrees, including the captain himself. "Company G – Wounded – Capt. Sam Copwood, slightly; Corporal A. Copwood, slightly; Corporal L. Pearce, slightly. Privates J. A. Rife, severely; W. C. Black, severely; John Black, slightly; E. W. Dickson, slightly; E. W. Bennett, both legs broken; John Coyle, arm broken; J. A. Posey, severely; Geo. Reid, badly; W. P. Darnell, both legs broken." Company K of the 35th Mississippi Regiment also suffered injuries, but listed no deaths. "Wounded – J. W. Stevens, slightly in eye; P. D. Green, slightly in face; H. S. Ford, slightly in leg; D. H. King, badly in breast; G. W. Brewer, badly; John Carroll, slightly; S. H. Logan, slightly; G. W. Lyons, arm broken; M.T. Newman, badly; W. E. Anthony, slightly; Geo. Critz, slightly; A. P. Leach, slightly; S. L. Stephens, badly; J. S. McCarter, slightly." Cone reported a few Mississippi soldiers from several other companies of the 35th as injured. "R. J. Harold, Company F, 35th Miss., slightly; R. H. Harper, Company F, 35th Miss., both legs broken; A. H. Pease, Company C, slightly." Among the victims were also men from other states. Previously, all of these had been in a hospital or a prisoner of war camp and were headed to Vicksburg for parole or to rejoin their units. "Thos. Fowley [Foley], 10th Tennessee, badly; J. Molaney [Maloney] 10th Tennessee, slightly; Mike McDaniel [McDonald], 10th Tennessee, slightly; J. A. Hall, Company D, 37th Alabama, slightly." The highest-ranking officer involved in the accident was forty-six-year-old Walter G. Kearney, a planter from Vernon, Madison County, Mississippi, who enrolled in April 1861 as a private in the Beauregard Rifles, and rose, by election, to the rank of Lieutenant Colonel of the 18th Mississippi Regiment by November of that same year. He suffered an "arm and forearm broken" in the wreck. Cone wrote of him – "The loss of the service of the valuable and daring services of Lieut. Col. Kerney is also greatly to be regretted. He was among the first of Mississippi’s sons who volunteered. He has been in several of our great battles, and acquitted himself nobly." Several people were singled out as heroes for their role in the rescue and recovery of the victims. A wealthy local Hinds County planter, McKinney L. Cook, whose large plantation and home, "The Mansion," lay near the scene of the wreck between Edward’s Depot and Smith’s station, did all he could to assist. Cone said of him, "Col. McKinny L. Cook is entitled to much praise for having brought his entire plantation force to the aid of removing cars, &c. from the wreck to extricate the dead and wounded." Concerning Dr. Charles T. Murphy, resident of Holmes County, Mississippi, and surgeon of the 4th Mississippi Regiment stationed near Vicksburg, Cone recorded that he, too, "rendered much valuable service." Private Cone ended his letter with these words - "The killed and wounded were brought to this place [Edward’s Depot] this afternoon, and properly cared for….Since the writing above, I have been informed that two more have died from their wounds." The Vicksburg Whig of New Year’s Day, 1863, mentioned the wreck only briefly, but exaggerated the number of dead. "Railroad Accident - We learn that a train loaded with soldiers on the Southern Railroad ran off the track yesterday near Smith’s Platform, killing some thirty, and wounding many others. The troops were coming to this city." The Whig also picked up the names of the dead from the Memphis Appeal which had their information from Cone’s letter. A Whig advertisement called for workers to repair the tracks. "Wanted Immediately - The Southern Railroad Company wants to hire ten Carpenters and six blacksmiths for Railroad work. Also, a number of able bodied men to work on track. Apply to Dr. Emanuel, Vice President at Vicksburg, Mississippi, or to C. S. Williams, Superintendent, Southern Railroad Company." However, by January 3rd, the Whig’s focus had turned to getting the important railway line up and running in a safe manner. "The Accidents on the Southern Railroad - We are glad to learn that steps have been taken to prevent a repetition of such accidents on the Southern Railroad as occurred a few days ago near Edward’s Depot. General Pemberton has turned his attention to the work, and the company have secured the services of Captain W. J. Ross, for many years connected with the Memphis and Charleston Railroad, and one of the best railroad men in the South. "A large force is to be put to work and the trains run so as to enable the hands to repair the railroad. New cross ties are to be put down and iron laid wherever necessary. If the company fails to get iron, General Pemberton will find it himself, if it is in the Confederacy, and see that it is put on the road. This is a proper move. The Southern Railroad is now the most important railroad in the country, and a force should be kept at work on it night and day until it is a condition to bear the heavy engines and trains that are brought over it from other railroads. Let the soldiers march here until the road is pronounced safe. We cannot afford, nor is it just, to have them bruised and mangled as they were the other day." The next day, on January 4th, the Whig defended and explained the poor condition of the line and its equipment. "The Railroad - For the last two or three days we have been without the usual arrival and departure of trains. Two passenger trains came in yesterday. The heavy rain of Saturday night over-flowing the swamp between Edwards’ and Bolton’s [Baker’s Creek] and damaging the railroad near Forrest, was the cause of their detention. "The disposition manifested some to raise a cry against the management of this railroad on account of the recent accidents, is we think, inconsiderate. The railroad was built with light iron twenty-odd years ago between Vicksburg and Jackson, designed for the local business of forty-five miles, to be performed with light engines carrying light trains. It was built with an unusual number of heavy grades and sharp curves. "The exigencies of the Government has devolved upon this railroad the heaviest kind of work, forcing the company to the necessity of using the heavy engines of other modern-built railroads carrying the utmost number of heavy trains that could run over it, putting on it five times as much as it could safely bear. We have the assurance of the officers of the road that every effort has been made to procedure cross ties and hire laborers at full prices to keep the railroad in repair, and their instructions to those in charge of repairs, are to make the railroad safe, regardless of expense." Obviously, plans were in the works for improvement on the line, but by May, the railroad would be in the hands of General U. S. Grant, and its condition would become a mute issue for the Confederates trapped inside Fortress Vicksburg. “Union Army Occupies Cook Plantation.” Rebecca B. Drake and Sue B. Moore. Vicksburg Whig, December 31, 1862; January 1, 1863; January 3, 1863; January 4, 1863 – Transcriptions courtesy of James Earl “Sam” Price, Vicksburg, Mississippi.